(accompaniment and chamber music), and was unanimously awarded first prizes for piano and chamber music. He then followed the advanced course with Jean-Claude Pennetier. In 1987, he won the International Piano Competition in Senigallia (Italy), and received in 1989 the Mozart and Robert Casadesus Prizes at the International Competition in Cleveland. Those distinctions are the start of a brilliant international career. His recording of Debussy’s complete piano works has been unanimously acclaimed by the international press and has reaped many awards (Diapason d’Or, ffff Télérama, Award BBC Magazine). It is already regarded internationally as a reference. His Debussy’s recording is internationally-renowned. 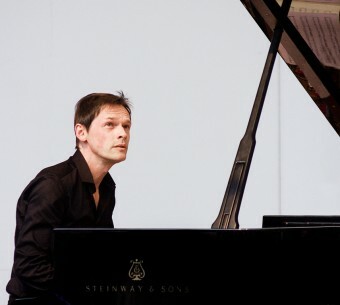 François Chaplin now appears as a soloist in many of the world’s capitals, including Tokyo, London, Paris, Berlin, Moscow and Mexico, to name but a few, and with many fine orchestras such as the Japan Philharmonic, the Saint Petersbourg Philharmonic and the renowned French national orchestras. He appears regularly at important festivals, including La Roque-d’Anthéron, Saint-Bertrand-de-Comminges, the Chopin Festival at Paris Bagatelle, the Chopin Festival at Nohant (Rencontres Internationales), Pontlevoy, Reims (Les Flâneries Musicales), Cervantino (Mexico), Yokohama (Japan), Saint Petersbourg, Riga, Kazakstan, etc. In chamber music, François Chaplin is used to perform with quatuors like Talich Quartet, Elysées, Psophos and Debussy. He collaborates with cellists like François Salque, Emmanuelle Bertrand and pianists like Cedric Tiberghien, Marie-Joseph Jude and the clarinetist Patrick Messina. His concerts and recordings have met with great critical acclaim, and he has been described as “one of the most original and engaging of all French pianists”. His sumptuous sound, great expressiveness and feeling, and his intelligence as an artist enable him to understand and bring out the dark moods of Brahms, the whimsicality of Schumann, the brightness of Debussy, and the personality of Mozart, Poulenc and others. François Chaplin’s other recordings include works by Chopin (Ballades, Barcarolle, Berceuse), Schumann (Kreisleriana, Kinderszenen), Poulenc (works for two pianos with Alexandre Tharaud), Carl Philipp Emanuel Bach (sonatas) and Mozart (concertos, chamber version). On the occasion of the bicentenary of Chopin’s birth, François Chaplin recorded the complete Nocturnes (label Zig-Zag Territoires/Harmonia Mundi) in March 2010, acclaimed by critics (ffff Télérama) and labellised « Chopin 2010 en France ». For this event, François Chaplin performed on the most famous international stages. On the occasion of the 150th anniversary of Claude Debussy’s birth in 2012, François Chaplin recorded with the famous French pianist Philippe Cassard a new CD of the complete works for two pianos by Claude Debussy. This new CD came out the 15th of January 2012 and a tour of many concerts on the most international stages is organized. Le langage de Scriabine est tout d’abord hérité de Chopin. Comme ce dernier, son oeuvre pour piano est prépondérante et a souvent servi de « laboratoire » à d’autres œuvres.